I am way too tired to write this blog, and my feet are still complaining quite loudly from climbing way too many steps, but it has been such a huge day, I feel I must make a valiant attempt at recording a bit of it in case it gets lost in tomorrow. I will start at the beginning – The Eiffel Tower. Mairi insisted we walk up it, even though there was hardly a line-up at all for the elevator. Not surprisingly, there was nobody in the line-up for the tickets to walk up…anyway, walk we did. 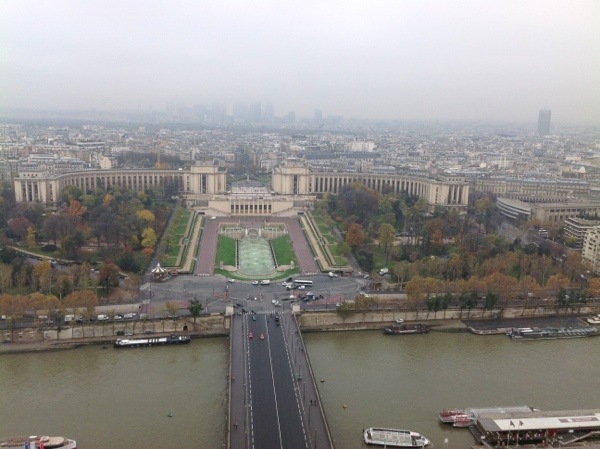 The 670 steps not only gave us our day’s workout, but also provided some pretty great views of Paris. 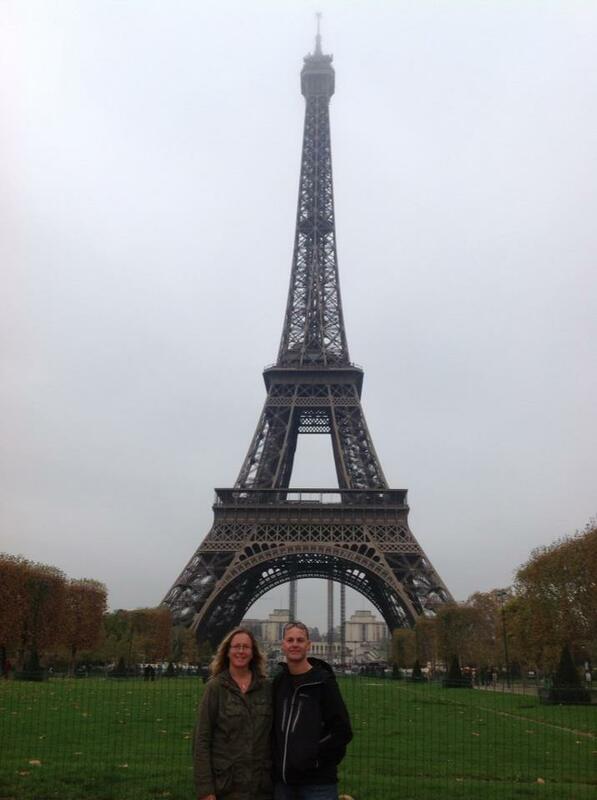 My legs were shaking just a little when we got back down, but by the time we had done the obligatory photos in front of the tower, they were back to normal and we were off to Notre Dame. The plan was just to have a look and move on, but we were drawn inside by the fact that it, too, was pretty quiet. 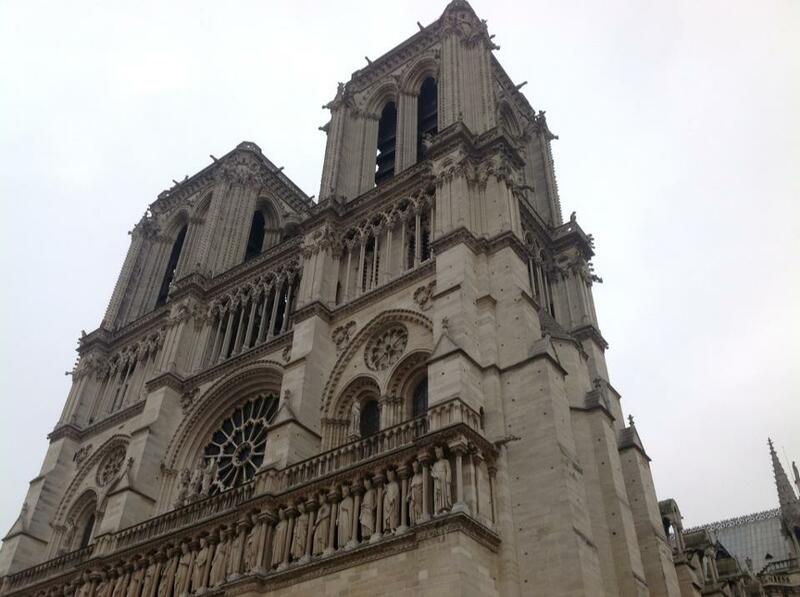 It is a stunning cathedral, and the girls loved pointing out features they had seen in The Hunchback of Notre Dame – even the floor is the same as the one Esmerelda was thrown onto, apparently. And the gargoyles are the very ones that befriend Quasi Modo. Imagine. Quick walk to Pont Neuf so Liah could see where Madeline fell into the Seine and was rescued by Genevieve, the dog, in the Madeline books. Hard to believe she could have survived that 50 foot fall into such a fast-moving river. Mmm. All good so far. Then began the slightly less successful part of the day. 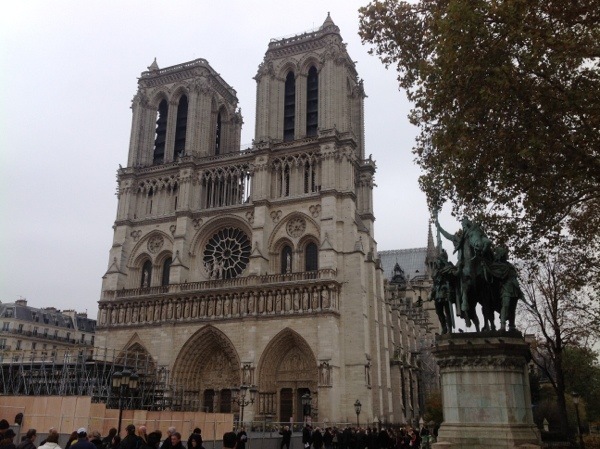 We walked to the Latin Quarter because the guide book said it was full of street performers and really cool places to grab a quick, cheap, but good lunch, and we were pretty close by….not. It looked close on the map, but we miscalculated and ended up walking for about 45 minutes. We were all getting very tired, and the kids were really hungry by this time. When we finally arrived at THE street, it was kind of lame. Nothing much happening, and no real lunch options we felt we had time for. We ended up getting a sandwich at a boulangerie and eating it standing up. By this time, Liah was done, so we revived her by telling her about the world famous ice-cream maker with 70 flavours of ice cream. Yay! Then we took a metro back to the islands, walked to the ice cream place, and found that it only opened Wednesday to Sunday. Oh. Well, while we’re in the area, we might as well walk up to the Pompidou Centre to check out all the street artists. That might be fun, right? And we’ll get a treat somewhere else. But there were none. No street artists. No treats. Wrong time of year, perhaps? By this time, we are all getting pretty exhausted, a little cranky, and feeling like going back to our apartment for a rest, but I had received a text from my friend Kim that morning telling us that we should go see her friends Andrew and Jules in Place de Tertre. Just go up and knock, she says. 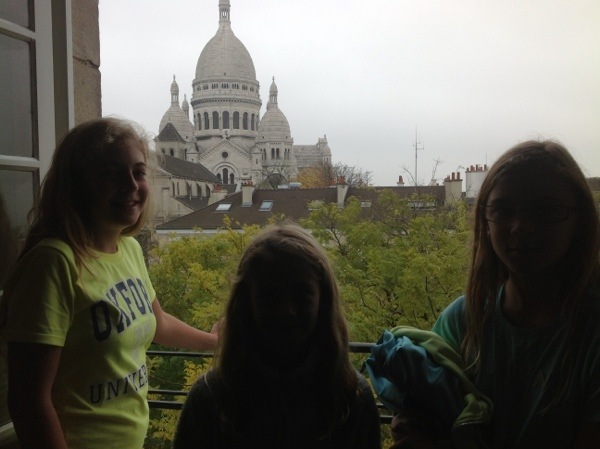 They have a great view of Sacre Coeur – it will be an experience. So, since we haven’t taken any of her advice so far today, and I dread her wrath, we decide to push ourselves a little further. We make our way via Metro to the nearest stop, which involves climbing about 200 steps to get back above ground. My feet are not happy. Neither are my legs. Then, we check the map, determine which way to go, round the first corner and see in front of us about another 500 steps to get to Montmarte and Place de Tertre. I moan a little inside my head. Well, actually, I moan quite loudly outside my head. But I meant to moan inside my head. By the time we actually get to the apartment (which is on the top floor of an elevator-free building, naturally), I am in a lather. Which is good in a way, because it’s pretty cold out and now I’m warm. But I’m literally dripping in sweat, which is not so great. We knock on all three doors at the top because we don’t actually know which it is, and luckily only one door opens. We say we are looking for Andrew and Jules, and the guy looks at us blankly, but says yes, he is Jules. Then the other guy comes to the door and quickly realizes we are the Canadians sent by Kim. We are welcomed warmly and ushered in. And we spend a fascinating hour looking at their incredible view, and chatting about various things. Including the fact that Andrew used to be the Queen’s butler. What?!?! He shows us a photo album with pics of him and Princess Diana, and other members of her family, tells us funny stories about the Queen Mum, and other Royals. Oh, and more pics too. Of him and Maggie Thatcher, who was apparently not all that “Iron” when he worked for her. And then there was King Fayed of Saudi Arabia. And the Onassis place where he used to vacation with Christina. Oh, the list goes on. The girls are enthralled. Well, we all are really. And in their down time they offer Secret Romantic Dinners Parisian style. 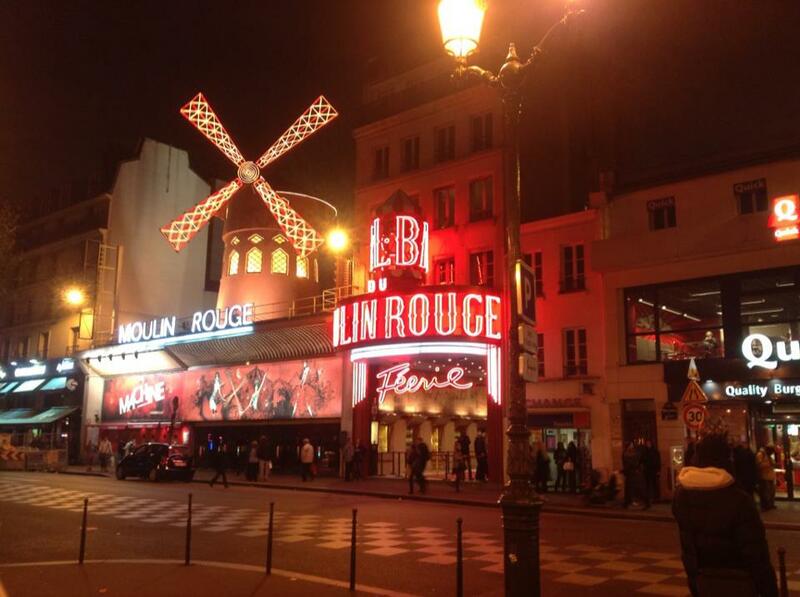 So if you ever want to propose to your significant other with a backdrop of the Sacre Coeur, this is your big chance! Or maybe you want to celebrate another special occasion in style – this is something totally unique and especially tailored to what the customer would like. Amazing. I might come back someday when I’m a bit more up-market. Anyway, after having a cup of tea and a scone, and using their bathroom/art gallery, we are feeling revived and refreshed. We venture back out into Montmarte and stroll around as it starts to get dark, basking in the afterglow of our little adventure. We decide to walk home, and pick up some great food on the way. Ten hours after leaving our apartment this morning, we are back, eating our meal. My only regret of the day? I really should have asked Jules if he could do a little something with my self-imposed mullet-like hair style. I could have come out of there a whole new woman!